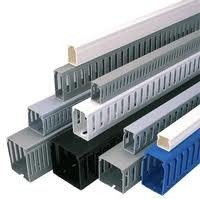 The Silicone Coated Duct offered by us is is made from virgin, flexible HDPE. Tuffline HDPE Silicon Smooth Inner wall cable Duct also known as PLB (Permanent Lubricated Duct) and is used for Optic Fiber and copper cable networks. Silicone Coated Ducts can easily be swept to make gradual bends without special forming equipment. Due to our years of expertise in this realm, we are readily affianced in presenting an exceptional quality variety of Cable Ducts. We are amongst the most reputed names in the industry, offering Power Cable Conduit & Telecom Cable Duct. We are the leading manufacturer and exporter of HDPE Cable Duct and our product is made of good quality. Cable duct or trunking is an ideal way of hiding, disguising and managing cables and wires. PVC coated, galvanized flexible conduit, small fiberglass cable trunking and large industrial steel trunking are just some of the cable trunking options available. Type: Cable duct straight channel.